The design of your products, containers, packaging and printed matter has a direct impact on all the business process and involves all departments; finance, production, marketing, sales, communication to internal and external stakeholders, government affairs and public relations, as well as the consumer and the end of life, with an impact on your bottom line. Extended Producer Responsibility (EPR) is an environmental policy approach in which the producer's responsibility for reducing environmental impact and managing the product is extended across the whole life cycle of the product, from selection of materials and design to its end-of-life. Any business and organization, of any size, any industry and any revenue, that markets products, containers, packaging and printed matter, with their own brand, private label or manufacturer, a manufacturer, distributor or importer. An expert in environmental management, Marina Pietrosel brings to the table a vast knowledge of and experience with environmental awareness and environmental Laws compliance, fees development, cost allocation and funding models, process waste management, product life-cycle analyses, eco-friendly packaging, and the exploration of emerging materials for the future. While efficiently managing a wide diversity of projects, she has made strategic relationships within the industry, including stakeholders, private corporations, government representatives, pivotal organizations and relevant associations. She has built an impressive portfolio of project management successes, as well, working with top decision-makers and industry KOLs (key opinion leaders). 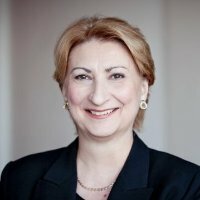 Her expert skills in managing and directing multi-disciplinary teams, as well as her dedicated work on various national and provincial environmental committees, has earned her respect and recognition from the many engineers, analysts, economists, industrial designers and other professionals with whom she collaborates collectively. ACADEMIA: Specialized Graduate Degree (D.E.S.S. ), Master level, in Management and Sustainable Development, as well as a Bachelor degree in Management, from the École des Hautes Études Commerciales de Montréal (HEC), a globally-recognized institution and one of Canada's leading business schools. The conference will be bilingual.